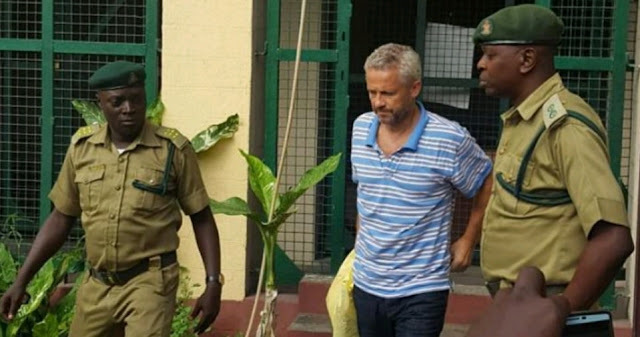 A court in Yaba Lagos on Wednesdy remanded a Danish citizen, Peter Nielsen, suspected of killing his wife, Zainab Nielsen, and their three-and-a-half-year-old daughter, Petra. Chief Magistrate Kikelomo Ayeye remanded Nielsen, 53, in Ikoyi Prison, following an application by the police. Nielsen was docked on a two-count charge of unlawful killing. The charge, marked B/87/2018, was read to the defendant in English. According to prosecuting counsel, Effiong Asuquo, a Chief Superintendent of Police (CSP), the offences were punishable under Section 223 of the Criminal Laws of Lagos State, 2015. Asuquo tendered a three-page application, containing 15 grounds for Nielsen’s remand. According to Asuquo, a fight broke out between the couple in their flat at about 3am. Nielsen was allegedly seen fighting and hitting her head on a wall by his wife’s two relations, Mimi, 11, and Faith, 13 who lived with them, following which she died. The prosecutor alleged that Nielsen then poisoned Petra before dragging her body into the kitchen. Chief Magistrate Ayeye upheld his prayer. She remanded Nielsen and adjourned till May 8, for the DPP’s advice. Mchew, may we not be unfortunate.